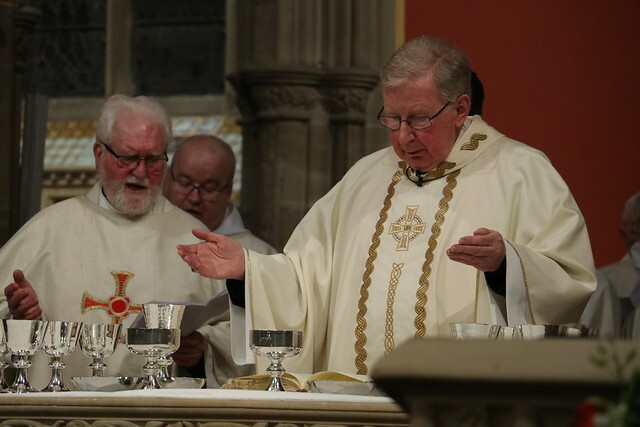 On Friday 22 February 2019, a Mass of Thanksgiving marking the Retirement of Bishop Séamus, the thirteenth Bishop of Hexham and Newcastle took place at the Cathedral Church of St. Mary in Newcastle upon Tyne. The Mass was attended by members of his Family, Clergy, Religious and Laity from all across the Diocese. A moving and humorous Homily was read by Father Peter Leighton, before gifts were presented to the Bishop from representatives of various organisations from around the Diocese. Bishop Séamus celebrated 50 years of Priesthood in June 2016 and was ordained as Bishop of Hexham and Newcastle in March 2009 on the feast of St. Cuthbert, patron of the Diocese. You can read more about his long and dedicated service to the Diocese here. Photos from the evening are now available below.